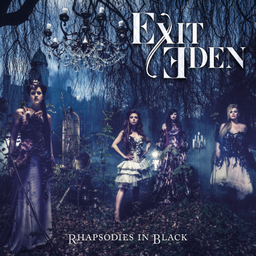 Most of the symphonic metal fans have heard Exit Eden’s album ‘’Rhapsodies in Black’’ by now. We published our review a while ago (you can read it here), but we told you we had another surprise for you.. Tamar got the opportunity to do a Skype interview with both Clémentine Delauney and Marina La Torraca! 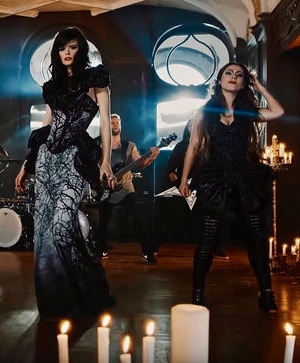 The band made a huge list of possible songs to be on Rhapsodies in Black, ‘’the theme was ‘’pop hits never to be heard in metal’’, Clémentine adds. ‘’When I joined all songs were already chosen.’’ said Marina. 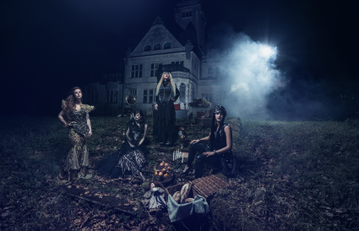 Three songs on the album also have guest vocals, on Total Eclipse of the Heart they chose Rick Altzi, and on Frozen and Skyfall they were joined by Simone Simons. I was curious to find out why a band already consisting of four vocalists decided to add these guests. Clémentine starts: ‘’We wanted to respect the spirit of the original song ‘’Total Eclipse of the Heart’’, and add a bit of contrast with the male vocals. When it comes to Simone, it was about making it a bit more appealing and diverse. We wanted someone who would enjoy doing this, because you’d be surprised.. Metal artists are actually not so daring to do pop songs or even ‘’taste’’ it. She adds a bit more spice and charm, because she was a totally different voice than us.’’ ‘’She had a huge fanbase and they would be happy with her bringing out new material too.’’ Marina adds. Clémentines favorite song is Frozen ‘’I have been listening to that song for 10 years so I was extremely happy when it was confirmed’’, Marinas favorites are Impossible, Paparazzi and Question of Time. What is the biggest difference between their own bands and Exit Eden? Marina answers: ‘’Covers! Haha! The only thing Exit Eden has in common with Phantom Elite is me! Exit Eden is a bit more out of my comfort zone than Phantom Elite is. Both projects are so different which makes it really fun.’’ Rhapsodies in Black has been released for a while now, and all fanbases were really excited. Clementine: ‘’My fans are really amazed, but they are also waiting to hear the rest before they make an opinion. In general, even from Amanda’s fan base it was great.’’ ‘’Overall the reactions are pretty good! Better than we expected actually.’’, Marina adds. Special thanks to both Clémentine and Marina for making the time for us!